My husband and I got married this year, and ever since we came back from our honeymoon, we’ve been talking about how excited we are for our first holiday season as a married couple. We’ll finally get to introduce each other as husband and wife at those big family gatherings, we’ll get to send out our first Christmas card together, and we’ll get to start our very own family holiday traditions. There was just one problem: a lot of holiday customs we love (driving around the neighborhood to see the houses decorated with lights, going to the mall to see Santa, and writing up a gift wish-list) seemed more appropriate for a family with kids. I wondered if it would be difficult to find fun and festive traditions for just the two of us. So, I contacted some friends and family to ask for their favorite “couple” traditions. What we found was amazing. We hear everything: from traditions that were romantic to super silly ones. I heard beautiful traditions that could help any couple grow in their marriage and modern family rituals that can be carried on even after having kids. 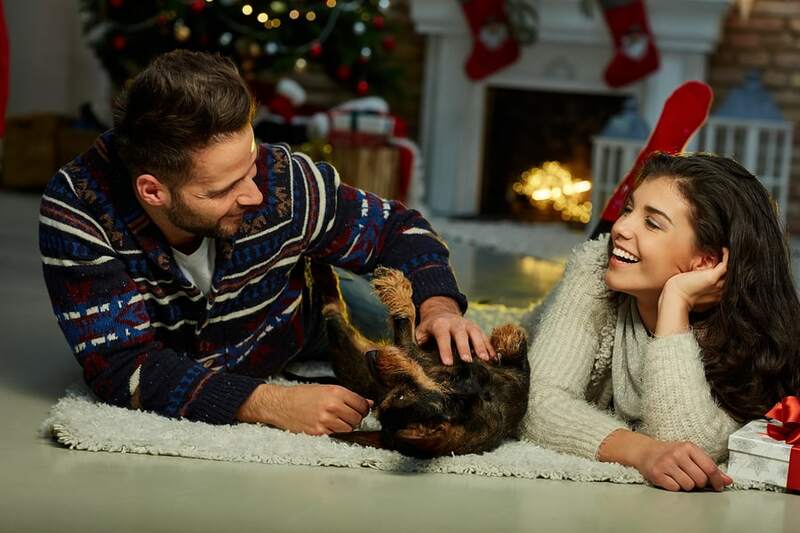 Here are 10 great holiday traditions you and your partner will love this holiday season—and for many years in the future. A lot of people make a tradition of watching the same movies every holiday season, usually it’s something festive, like Love, Actually or The Muppet Christmas Carol, but when it’s just the two of you, you don’t always have to stick to the traditional, kid-friendly movies. My husband has a friend who sits on the couch with his wife every Christmas Eve and watches the entire Lord of the Rings Trilogy… (or at least they watch as much as they can before falling asleep). He says that every year is a little different: sometimes they order pizza and keep their movie night low-key, sometimes they decorate cookies through the evening, and once or twice they’ve invited friends over for the marathon. No matter what, he says they always have fun and it’s the thing he looks forward to the most during the holidays. I love this tradition because it’s so easy to make it your own. When my husband and I heard this marathon idea, we were completely inspired. We decided to start our own tradition, every year we’ll watch a different iconic movie series: like Star Wars and The Hunger Games. This year we’re starting with The Godfather. We might not end up watching all the movies in one day, but we’re excited to add to our usual holiday movie lineup. 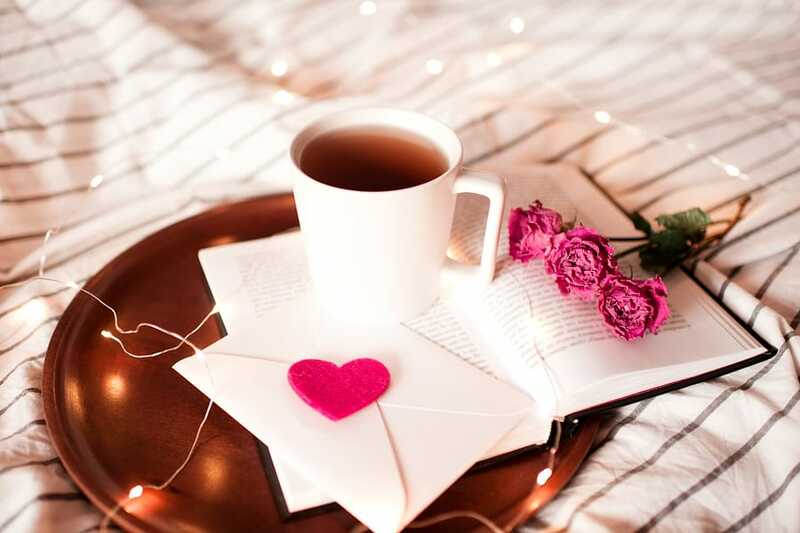 There’s nothing quite like reading a love letter from your honey, especially during the stress of the holidays. I have a friend who found, early in her relationship, that she and her husband had more arguments during the holiday season. There would be disagreements about whose family to celebrate with, how much time to spend there, and how much money to spend on gifts. By the end of the year there’d be a lot of tension that wouldn’t dissolve until after the new year. One year, the husband (then boyfriend) wrote my friend a little love note, saying how much he appreciated her all that year, and wrapped it with her christmas present. She was so touched by it that now, years later, they have a holiday tradition around it. Every Christmas they write each other little notes and leave them for the other to find on Christmas morning. Now they have kids so sometimes they read their letters on Christmas Eve after the kids are in bed, or Christmas day when the baby is down for a nap, but the tradition lives on. While the love letter idea is wonderful in and of itself, I’d love to steal it and build on it. Perhaps collecting the notes form each year and putting them in a box or a book. Then after some time, maybe twenty years in the future, we could look back on all our Christmas love notes to each other and see how our love has grown. One of my friends from work says she and her long-term boyfriend don’t generally celebrate the holidays. However, over the past few years they’ve been making a tradition of writing a list of goals for the new year. 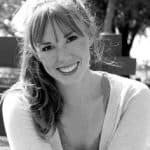 She says that some time at the end of the year, New Years Eve or maybe the day before, she and her boyfriend sit down together and make a list of things they hope to do over the next year. Some goals will be professional (like getting a new job or a promotion) some are personal (like taking a cooking class or going to the gym more) and they try to always include a few that are more relationship-focused. My friend says that the list-making isn’t always super romantic but she thinks that it helps bring the two of them closer together. They start the year reminded of each others’ goals and dreams, and that helps them understand each other better and continue to support each other. An old friend from college said that a few years back he learned there’s an Icelandic tradition where everyone in the family gets a new book on Christmas Eve and then spends the evening reading. He loved the idea, and since he and his boyfriend are “book people” they decided to make a tradition of giving each other a new book every year for Christmas. Their tradition is a little different from the traditional Icelandic one, as they open their books on Christmas morning then sit down to read together on Christmas night, but he says he loves having some quiet time to sit together and read. My cousin’s family used to always get matching pajamas for Christmas. They’d open their plaid or snowflake covered pajamas on Christmas Eve and wear them all morning. Looking back, my cousin said he thought the tradition was a little “too 80’s” to continue, but I guess he still liked the gesture. After he got married, he started getting his wife and himself matching fuzzy Christmas socks every year. Now they have kids and they’ve continued with the tradition (though he says he now has to go online to find matching socks that come in adult and kid sizes). This tradition is so much fun… and versatile! If you and your significant other are sock lovers, this could be a perfect tradition for you. But if you’re a couple who likes to wear matching shirts, or if it’s cold where you live and you’d prefer matching mittens, you can apply this adorable tradition to anything you like. A couple I know moved up to the mountains a few years ago, to a town where they expect snow every year. Being from the high deserts of southern California, they’re always amazed by the snow every winter. While it’s not necessarily an official holiday, they like to celebrate the first snow of the season by making plenty of Baileys and hot coco (with lots of whip cream) and simply sitting by the fire. Being in a place where it never snows, I think this tradition is easily transferable to any time during the holidays: as a Christmas Eve treat, a drink to serve family after dinner, or even a new year’s toast drink. I have an old friend from college who would never hesitate to admit how bad her cooking was. She used to say that the only thing she could “make for dinner” were reservations. Which is why I was so surprised to hear that she and her fiancé have a tradition where, on Christmas Eve, they set aside a few hours to try out a new dessert recipe. She says she always finds a recipe online for a unique dessert and the two of them try to make it. She says it’s so much fun to challenge themselves and she loves having alone time with her fiancé as they bake. Still, she says that her favorite part of this tradition is saving recipes they like, and practicing making them again through the year. She hopes that one day, when they have kids, she can impress them by teaching them how to make fancy peach tarts or profiteroles. While it’s fun to try a different recipe every year, it could also be fun to pick one signature dish (one that might be too difficult to make all the time) and make it for the holidays. It doesn’t have to be one of the more traditional desserts, like a pie or gingerbread cookies, either. Think outside the box by frying doughnuts or making apple strudel, it’s a great way to give the holidays your own personal touch. While some may be trying to get better at cooking and baking, one of my husband’s old college friends has had about enough of it. He and his wife always host a big Christmas party a few days before the holiday and cook a feast for their friends. 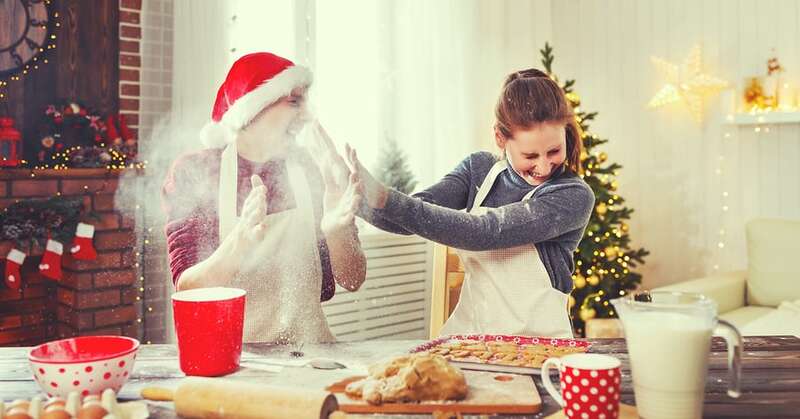 While they love cooking together, by the time the party’s over, they’re too tired to make anything for Christmas Day. A few years back they made a tradition of ordering a ton of Chinese food on Christmas Eve—and it stuck. He says that every year he loves the holiday party they throw, but his favorite tradition is always sitting back and relaxing with a bowl full of noodles, watching TV and waiting for Christmas morning. A woman I used to work with said that she and her wife love to volunteer together every year. One year they helped stock shelves at a food bank, another year they helped plant trees, and another year they walked shelter dogs. She says that it’s so satisfying to give back, but she also loves the opportunity to spend time with her wife and do new activities together. I think this is such a beautiful tradition that will not only bring happiness to others, but could strengthen your bond as a couple. Of course, couples interested in volunteering don’t have to find a different charity every year, and they don’t have to feel like they have to stick with it through the seasons. Simply taking the time to go help at a local food bank, or pass out flowers at a retirement home at the end of the year, can make all the difference. One of my husband’s cousins says that one year she heard about a tradition of getting an ornament from wherever the couple vacationed that year. While she like that idea, she decided to do one better, and make their own ornaments that represent their favorite memories from that year. One Christmas they got a round piece of wood, drilled a hole in the top to put a string through, and wrote down their favorite memories from the year on the front and back of the ornament. The year they got married, they used two small glass panes to preserve a single flower from her bouquet. She says they have so much fun getting creative and making ornaments every year, but what she loves about this tradition most is knowing that one day the tree will be full of dozens of amazing memories from years past. There are so many ways to celebrate the holidays, and these traditions are only the beginning. You can change and update these traditions, or even combine some to make something completely new. 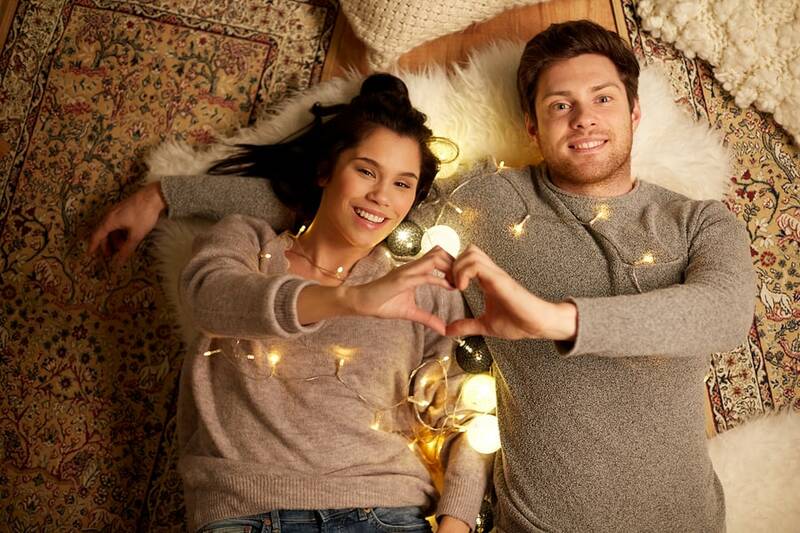 The best part about creating your own holiday traditions as a couple, is your traditions can be uniquely… you!